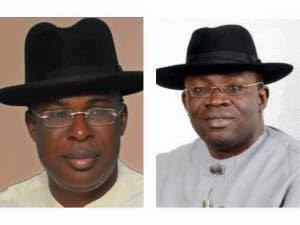 Governor Seriake Dickson and the Candidate of the All Progressive Congress in the Bayelsa 2015 Governorship election in Bayelsa State Chief Timipre Sylva will tomorrow July 26th 2016 know their fate as the Bayelsa Governorship election Petition Tribunal sitting in Abuja has revealed that its Judgement comes Tomorrow. According to the Secretary of the Tribunal Only 2 Representatives for each of the petitioners and each of the respondents shall be allowed inside the Court Room; apart from the counsel to the parties. It will be recalled that Chief Timipre Sylva of the All Progressive Congress had gone to the Bayelsa State Governorship election tribunal seeking to be declared the Governor Of Bayelsa State on grounds that the first results from Southern Ijaw Local Government Area cancelled by INEC showed he won the Election.